As a general life rule, I think we could all use a little more class and a little less sass. Which is why I love this adorable graphic tee by Le Motto. In addition to this one, they have other fun, uplifting sayings that are friendly little reminders to be a good human. And since their primary focus is how words can impact us, 10% of all purchases go towards anti-bullying causes. Pretty cool, right!? 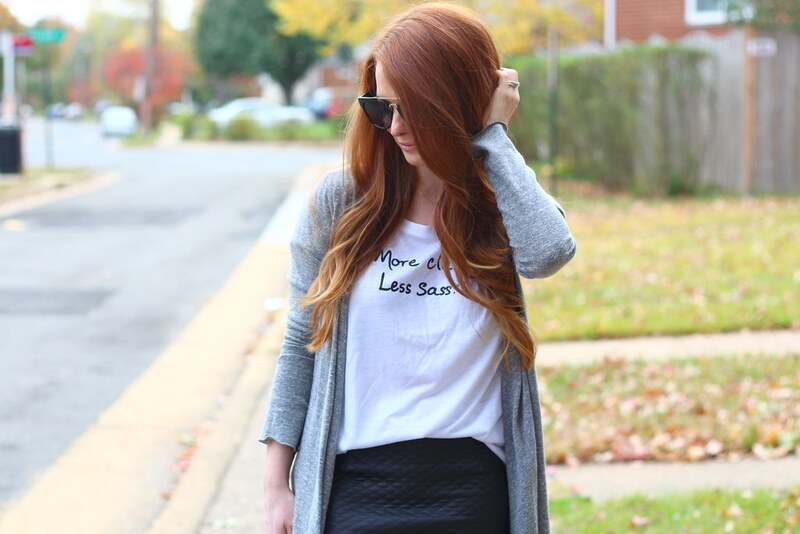 On another note, this skirt has been one of the most-worn pieces in my fall wardrobe. I wear it with everything from oversized sweaters to button downs and slouchy tees. It's from last year, so it's sold out, but you can get similar ones here, here or here! Love this look. Chic and stylish. Great shoes too! Love this outfit! So elegant and feminine!